1) Cruz-ing with conservatives. Sen. Ted Cruz received a standing ovation after his remarks to gathering of social conservatives in Washington. The Texas senator also faced his share of hecklers, who he eagerly took on. "Let me make an offer to the President," Cruz told the audience. "I would welcome the President if he wants to get 100 of his rabid political operatives in a room, I'll answer their questions on tv as long as he likes. And in exchange, all I would ask Mr. President, is you take not 100 but 10 of the men and women in this room." 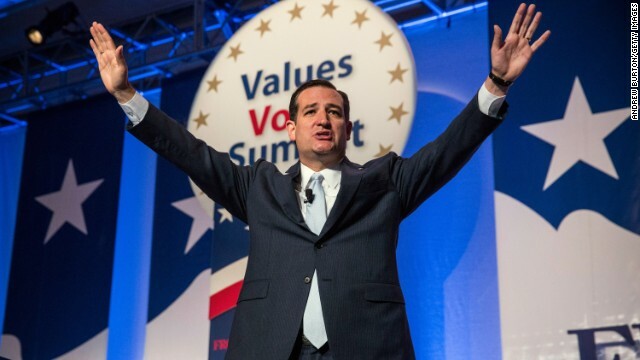 Cruz was one of several prominent speakers to address the Values Voter Summit, sponsored by the Family Research Council. 2) Dr. Carson's Obamacare diagnosis. "The worst thing that has happened to this country since slavery," was how prominent neurosurgeon and conservative star Dr. Ben Carson described the health care law during his appearance at the Values Voter Summit. "In a way, it is slavery," Carson said. "Because it is making all of us subservient to the government." 3) Republicans damaged by shutdown. A new NBC-Wall Street Journal poll has bad news for Republicans. The survey found the public blames the GOP for the government shutdown more than President Obama by a margin of 53 to 31 percent. The poll also found that only 24 percent of respondents have a favorable opinion of the Republican Party. 4) A break in the stalemate? A House vote to raise the debt ceiling could happen this weekend. House Republicans have offered President Obama a plan that would raise the nation's borrowing limit but not immediately reopen the government. But in an interview on Bloomberg's "Political Capital with Al Hunt," Republican Rep. Peter King said the House would "overwhelmingly" pass clean short-term bill to raise the debt limit and reopen the government. "It's going to pass overwhelmingly," King said. The White House said on Friday Obama had concerns because the GOP proposal wouldn’t end the government shutdown. 5) A third way. More Americans than ever say it's time for a new major political party. A new Gallup poll finds 60 percent of people surveyed believe Democrats and Republicans are doing such a poor job of representing the public that a third party is needed. Only 26 percent think the two political parties adequately represent Americans.